The other day when I was at the fishmongers I noticed that they had some calamari or squid. I had been wanting to try calamari for a while so I picked some up immediately. As luck would have it the calamari was already cleaned up, so there was less work for me. Whenever I have seen calamari it had always been served fried so I decided to go with fried calamari for the first time. I kept it simple and dredged the calamari in a simple mixture of flour, salt and pepper. Making the fried calamari was as easy as making french fries. The calamari was nice and crispy on the outside and warm and moist and slightly chewy on the inside. I quite enjoyed the texture and chewiness of the calamari. I served the fried calamari with some tartar sauce and some slices of lemon. I wonder what other things I can use calamari in? Mix the flour, salt and pepper in a bowl. Dredge the calamari in the flour. Fry the calamari in the preheated 357F oil until golden brown, about 2 minutes. I love calamari, but I confess I have never made any myself. I recently had some at a local restaurant and they served it fried with a Chinese style black bean dipping sauce, it was excellent. Yours looks super, too. I have never had calamari. I don’t know if I could eat it unless someone told me it was something else…just a head thing, ya know? In any case, it look edible! LOL. Who knows, maybe you could get me to eat it! I love fried calamari! Yours looks wonderful, as usual. Kevin I love calamari! And yours look so good, just like the ones from nice spanish bars, or maybe better! I also enjoy the chewy texture! Looks really yummy! I bought a seafood medley at my grocer that had calamari, octopus, crab, pollock and mussels. That looks good. I want to try making calamari at home, but have no idea how to cut it up (I think dissecting one in highschool has scarred me). Luckily, you were able to find it mostly prepared. You can also braise it in a tomato-based sauce. Or, another Chinese dish is “salty peppery” fried squid (that’s what it’s usually translated as). Usually, the squid are cut differently; that is, they’re not in rings. They’re fried then garnished/sprinkled with chile peppers and garlic. Crispy outside of calamari is worth dying for! I totally love this! Nicely done Kevin…It’s great to see you’re getting more confident with frying. Hi Kevin, Well you know Italians love calamari, we love to dip it in a warm marinara sauce. I like to buy them already cleaned too! Looks great! Your calamari looks great! You might try adding some (fried or grilled) to a salad with a tangy vinaigrette – it’s excellent. You are daring. I’ve always been scared to cook calamari because I don’t want to be disappointed. You’re an inspiration. As always. this looks nice and crunchy. beautiful color too! If anyone can come up with a creative way to use calamari in another dish, it is you! zuppetta di pesce, mussels, shrimp & scallop steamed in a spicy tomato garlic cream broth. The other is an appetizer, calamari sauteed with bell peppers, hot banana peppers, onions and lemon and served with zesty tomato sauce on the side. You might want to think of something like this for calamari Kevin, since you do like hot peppers!!! Following another beautiful plate of food, great calamari ideas in the comments as well! Oh yum! My entire family loves calamari. Outstanding recipe! 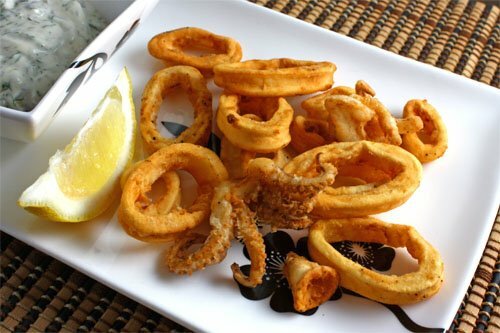 I love calamari – I had it when I was in Greece. Yours looks great Kevin. You keep making me want fried food as of late. And I love me some calamari! My all time favorite, Kev! Well done! This is the only way I’ve eaten it, so I think you made the right decision. How can you beat fried food? You can’t. Hmmm, I haven’t tried fried calamari at home before. I like it with a light bread crumb crust – panko crumbs would be great. I just had some fantastic calamari in an Italian restaurant in Providence last week. It was served with a marinara and sliced pepperoncinis. To die for. You should google Calamari Pizza. I like it when it’s nice and crisp like that! Wow that looks devine! I dont like Calamari much but I would eat that! That looks delicious! I’ve never attempted calamari but you’ve inspired me to give it a try. My favorite restaurant version tosses the fried calamari with pepperoncini rings and some balsamic vinegar – tangy and spicy! Thanks for sharing your cooking adventures! Clamari is also nice stuffed and cooked in red sauce (pasta sauce). I love it fried the best though. I always order it out at Maggianno’s for my birthday. Yours looks really great. It took me 20+ years, but I can safely say that I now love calamari. Beyond fried, I love calamari in a cioppino. I love that you don’t really use batter; battered squid is one of my biggest peeves. I have no recipe, but it’s basically a Sardinian pasta called fregola + all the ingredients in caponata except the eggplant + calamari rings. SO delicious, I recommend it. Yeah calamari that is already cleaned up is a treat..so much less work. This looks wonderful. I’ve only had calamari once, and didn’t really care for it. Maybe I should give it a try again, and make it myself! I love calamari with a nice marinara sauce for dipping… yum! Nothing beats the goodness of fresh calamari! yum! I can’t believe I’ve never had calamari, but I bet it’s delicious by the looks of yours! Yum! I love calamari. Your photo looks great! My first taste of calamari was at an Italian restaurant when I was little. A friend of my parents said “I’ll tell you what it is after you taste it.” I liked it so much that I didn’t care that I was eating squid! Having been born and raised in Texas, calamari was not something that was ever on our menu. However, I have tried it in recent years and really like it when it is fried (such as you prepared it). I love love love calamari. The key with calamari is not to overcook them, as they’ll become too chewy. You can stuff them as well if you find some whole ones. You can also use them grilled in salads. Cleaning them is fairly easy, nothing to worry about. I love fried calamari! I’ve never attempted to try it myself though! You are completely fearless in the kitchen! This is one of those simple yet very important standbys. There are few treats as good as fried calamari! I’m not always fond of cleaning squid but it’s always worth if I’m making this. Looks great, calamari is also good grilled with olive oil and balsamic vinegar on top of a salad. I love, love, love calamari but have been afraid to make it at home – not anymore! It looks fantastic Kevin. love calamari! always. calamari bap, kevin. fried calamari, tartar sauce, lemon juice, bit of ketchup if u fancy it in a lovely fresh bap! mmmm. Interesting, I have never had calamari before. This looks really good. One of my exs’ moms used to soak her calamari tubes in crushed tinner pineapple overnight to tenderise – and damn, she used to make tender fried calamari! Don’t miss him, but I do miss her calamari! Calamari is the best – yours looks really good. Yum! You might be interested in filling it with some rise, tomato, peppers, onion etc. there are too many recipies for these things in Greece (i mean rise stuffed vegitables and calamari style fish). Love your site and all your recipes I have tried are delicious! I cook calamari often and basically the same way but add lemon zest to the flour mixture as well as some breadcrumbs for extra crispiness. Serve with freshly squeezed lemon on them and tzatziki sauce on the side. Our favorite Greek restaurant serves it with chopped red onion on top. Maggie: Love the addition of the lemon zest!